Oven to 300°. My oven is a bit wonky and kept creeping up, so the end product wasn't perfect. And I am now likely to make a series of Pavlovas until I master that, so be warned. 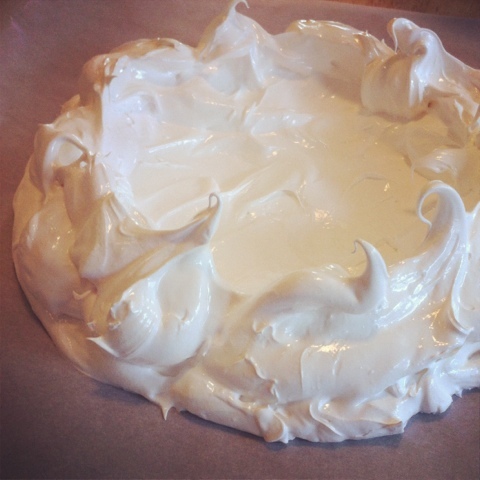 I based my recipe on Shuna's Pavlova (courtesy of Elise), so for technique, go there. But I didn't want to make individual ones, I wanted to make a big one. So I traced a 9" circle on parchment paper and filled that with a base for the meringue, then did big glops around the edge to make a 'bowl'. Like I said, it cooked too quickly due to my oven, so wasn't as pretty as I wanted it to be ... and was more crumbly too. 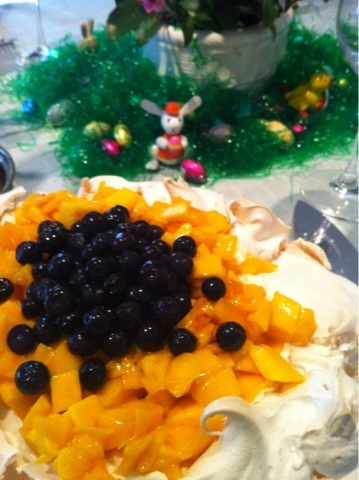 Just before serving, fill the 'bowl' with whipped cream and top with mangoes and blueberries. 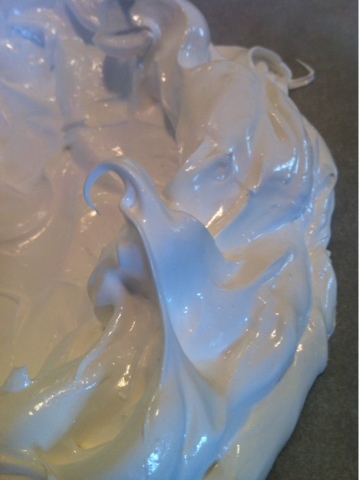 Even the not-pretty meringue, once topped, cleans up good. This first attempt was simple, but I'm already thinking of ways to top it.